I am looking for a finger puppet by Manhattan toy. 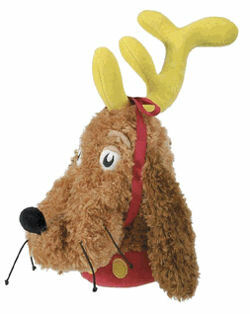 It is from the Grinch Who Stole Christmas finger puppet theater set- Max the Dog! My son loved Max best and decided he had to carry him to Target one day. Wouldn’t you know when we got home little Max wasn’t with us anymore. I called Target and even called Manhattan Toy – but the item is discontinued. I found a couple online new and emailed the people- but they wouldn’t break up the set. I can’t afford the $60+ price tag when I only need 1 of the puppets! Thanks! If you can help Stormy find this Max the Dog Finger Puppet from the Manhattan Toy Grinch Theater Set, THIS SITE IS NO LONGER ACTIVELY MANAGED. Please use Our FREE FACEBOOK GROUP, including #040708-3 in the subject, . ebay #350278138746 says hand puppet but might be worth looking. Wow. I had forgotten about this. No, he’s outgrown it. But thanks for the tip!